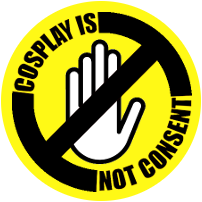 With the summer convention season just heating up, we would like to take the time to remind everyone that Cosplay is NOT consent! It does not matter the type of nerd/geek convention whether it is Anime, Comic, SciFi etc. This is a common issue that a flicks all conventions and events no matter the size or demographic. As a social medical charity dedicated to helping nerds in times of need. We see this issue all too often when we are at conventions and events. Our fans and people we help have told us countless stories about how this has affected them when they are at conventions. Let everyone have their personal space. If you want to take a picture ask. Please respect people’s right to say no to photos. Just because a person or cosplay is dressed a certain way is NOT a reason for unwanted attention, pictures or harassment. 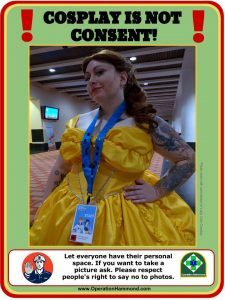 This is a serious issue that is not just for people or cosplayers dressed in revealing cosplays or outfits. Please share these pictures and feel free to use them to help spread the word. We would like to sincerely thank Kayci Kreations for allowing us to use her cosplay photo of Eris from Cat Planet Cuties and Cosplayer Lady Cels cosplaying Belle from Beauty. Be sure to visit these fantastic cosplayers on facebook! Click on the photo to download the PDF version.